US: Bantam edition published 2nd April 1973. 150pp. UK: Corgi edition published 20th July 1973 (0-552-09273-8); 150pp. Do Unto Others … Fast! That’s John Shaft’s golden rule — and the way he takes care of biz. This time it’s at the centre of a Mafia heist plan to cop a million from the Hotel Armand during a fag convention and put all the heat on a revolutionary brother. But things are not as Black as they seem until Shaft jumps in, fists first and gun burning holes in whatever moves. When the smoke clears and the bodies are all counted, it’s no news that SHAFT HAS A BALL. The first of four books Tidyman planned as a follow-up to the initial three he had written. He reasoned a production of books within the term of his 5-year contract with MGM for adaptations would maximise potential earnings. He sketched out plots for four more stories and looked for help in writing the books (Robert Turner and Phillip Rock). Robert Turner’s first manuscript was developed from an initial outline by Tidyman titled The Gang’s All Here, Shaft. The novel is set between Wednesday 16 August and Saturday 19 August 1972. 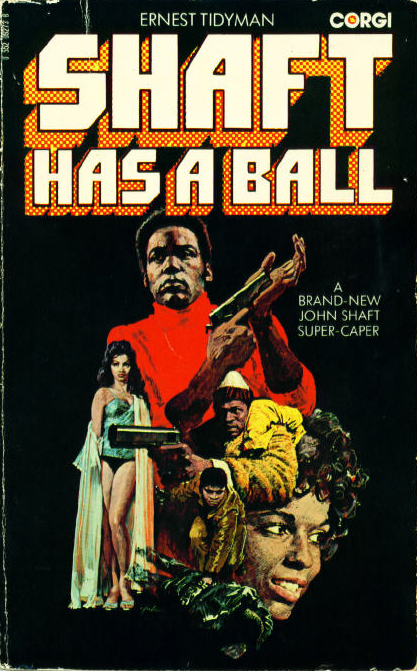 As Turner was completing SHAFT HAS A BALL, Phillip Rock was commencing work on GOODBYE, MR. SHAFT, which also used the character of Senator Stovall. The lack of collaboration between Turner and Rock and some poor editorial work by Tidyman resulted in errors in continuity between the two. Shaft felt like a paper bag full of bruised peaches, soft and squishy, ready to spoil. SHAFT HAS A BALL is a quick and entertaining read, but shows signs of its hurried route to publication. There are a number of unsatisfying elements to the story and a rushed wrap-up after the closing shootout in Yonkers. Additionally the violence has become more casual and the killings more frequent, relegating the book to the level of much of the men’s pulp adventure fiction of the time.